We are so excited to have Coty Inc. beauty brand philosophy as a sponsor for our Fall Pop-Up Shop. Adored by celebrities, dermatologists and, most importantly, their customers, philosophy believes in living a better life by being better to yourself. A philosophy that Fitzroy Boutique is all about. Also Oprah is a huge fan of the brand, so you know it must be good! 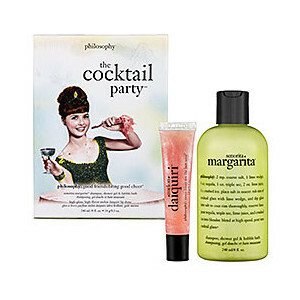 In the spirit of the TIFF cocktail party season we are giving away their "cocktail party" gift set, which includes senorita margarita shampoo, shower gel & bubble bath and melon daiquiri lip shine. My beauty philosophy is quite simple. It's key to always keep things as fresh and natural as possible. Never let products take over your natural radiance. This means finding beauty care products that are light, refreshing, have beneficial ingredients, and let your natural beauty shine through.